What, then, is this vector of change, this movement undergone in the shuttling between das Unbewusste, the term Freud used for “the unconscious,” and its Arabic translation as al-la-shuʿur, a term borrowed from the medieval Sufi philosopher Ibn ʿArabi and redolent with mystical overtones? As Allan comments, “if there is a translational vector to be traced, it might well not be a relation between source and adaptation at all” but instead “a translational vector toward the future.” Stated somewhat differently, can the archive of the Unbewusste be reopened and its meanings disseminated and proliferated with the concept of al-la-shuʿur, thereby highlighting an unknowability at the heart of the human subject in relation to the Divine? Would such dissemination dislodge the ontological and epistemological conceit of a universal grammar of the subject presumed by readers of the German Freud within certain strands of psychoanalysis? What might it mean, in other words, to rethink the epistemological and ethical contours of selfhood and psychoanalysis while standing in a geopolitical elsewhere? If translation aims “at that single spot where the echo is able to give, in its own language, the reverberation of the work in the alien one,” then my historical interlocutors found ample epistemological resonances between psychoanalytic and Islamic thought. Hence, the term that best captured Freud’s notion of die Seele or psyche was aptly rendered as the nafs (soul, spirit, psyche), a concept implying a spiritual core, alongside the presence of the unconscious (al-la-shuʿur) as a place where God could be manifested. Imbued with a primordial divinity, the term was intimately bound up with preexisting meanings. Its genealogical reach extended into Islamic invocations of the term used by Ibn ʿArabi and others. Significantly, as Bardawil perceptively notes, my displacement of this civilizational contraption departs, by necessity, from the major traditions of modern Arab thought and their attendant politics of decolonization, as exemplified by thinkers such as Abdallah Laroui. Laroui viewed the Arab intelligentsia’s response to colonialism and European hegemony as divided into two dominant trends: traditionalist Islamic thought, characterized by a repetitive recitation of the past or an alienation through time, and modernist thought, characterized by eclecticism and ideological backwardness, or an alienation through space. I depart, as well, from the Euro-American postcolonial reading practices that have reiteratively critiqued the historicist and secular discursive assumptions of these traditions of thought. Dwelling in the caesura between pre-modern and modern, between the trace of inherited traditions and the traumatic cut of colonialism in our encounter with the past across time and space, historians might be said to inhabit the space of the barzakh—a liminal zone or isthmus. Such an isthmus was conceptualized by the medieval mystic Ibn ʿArabi as a space between the existent and the nonexistent, the known and the unknown, “which is neither the one nor the other but which possesses the power (quwwa) of both.” Consequently, rather than assume the rigidity, mimesis, univocity, or separation of “traditional” and “modern” thought, I explore the ways in which writings on selfhood drew from both Islamic and psychoanalytic discursive traditions, understood as convivial bodies of knowledge subject to continuous reinterpretation. If, then, the plasticity of minor discursive traditions inaugurates a new grammar of the subject that is neither in emulation of, nor in resistance to the West, this plasticity likewise displaces the temporality of a homogenous, empty time that ushers in the post-colonial nation-state. 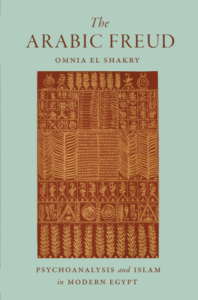 Omnia El Shakry is professor of history at the University of California at Davis. Her research centers on the history of the human and religious sciences in modern Egypt and she is the author of The Arabic Freud: Psychoanalysis and Islam in Modern Egypt (Princeton, 2017), The Great Social Laboratory: Subjects of Knowledge in Colonial and Postcolonial Egypt (Stanford, 2007), and editor of the multi-volume Gender and Sexuality in Islam (Routledge, 2016).